Many times, when you record a video from your own device, it can be saved on a file format that is not supported on Apple TV, such as AVI videos for instance. This does not mean that you cannot watch these videos on Apple TV. Luckily, there are some programs that you can use on your computer in order to convert AVI to Apple TV valid format. What you need to use is a converter that allows you to turn your videos as AVI to Apple TV compatible formats. One of the programs that you can use for it is the Aimersoft Video Converter Ultimate, which offers a simple way to do so for several files. It also does not matter if you use a Mac or PC, since the program has versions for both operating systems, and on each you will have pretty much the same options, which are very useful. For instance, you can simply select Apple TV from a list of devices, and the software will optimize the conversion of the video so that you do not have anything to worry about. Available for Mac and PC, this is a tool that will not leave you stranded whatever you operating system is. Batch converting capability makes it very easy to convert large amount of files in little time. Easy setup get your files in the format that you need them for your Apple TV or other devices so you do not have to worry about these settings. Works for video and audio so you do not have to look for any other software in case you want to enjoy your music library or even audiobooks or podcasts on your Apple TV. 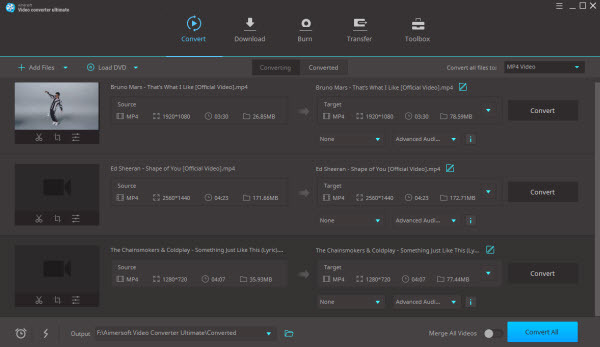 Open Aimersoft Video Converter Ultimate and make sure you are in the Convert tab at the top of the application. You can drag your AVI file into the center of the screen, or you can go the long way and click on the Add Files button located at the left top of the screen. Remember you can add as many files as you need to. On the right side of the screen you will see an "Output Format" section, as you click on the arrow at the dropdown menu below, you will see three columns, reading "Favorite", "Format" and "Devices", you need to click on this last column and make sure you select "Apple" after it. On this list you will see all of the Apple’s devices you can work with, and at the bottom, you can select between Apple TV, Apple TV2 and the New Apple TV, simply select your device and it will be ready to convert. Confirm the folder where your Apple TV videos and movies will be saved by checking on the "Output Folder:" option at the bottom of the screen. In here you may want to try changing it pressing the "…" button next to the address of the current folder, if you select your iTunes default video folder as the output folder for your converted videos and keep automatic syncing on iTunes, they will synchronize with your Apple TV once the conversion is finished. To start converting, simply click on the ‘Convert’ button at the bottom-right side of the screen. Aimersoft Video Converter Ultimate for Mac is easy to handle and you can convert your AVI files to Apple TV by 3 simple steps. Install and run this program. To add the AVI video files, you can simply drag and drop them into the workbench window. You can also load multiple files at a time because this program supports batch conversion. You can join all videos into one file by ticking "Merge all videos" on the bottom of the main window. Next, browse the formats in the format list and then select Apple TV preset format as the output file format. 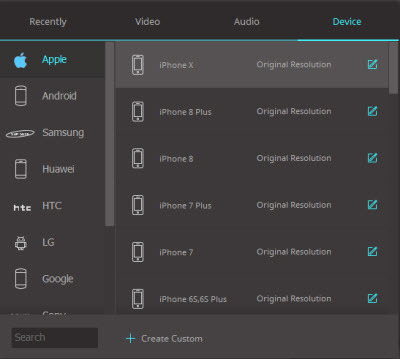 There are also optimized ready preset for for Apple TV, Apple TV 2 and Apple TV 3. Choose an output folder and click the Convert button to start the AVI to Apple TV conversion. Now that you have converted your files to Apple TV format, all you have to do is to transfer them to your Apple TV. In order to do this, you must add the converted videos or movies into iTunes. You0020can simply drag them into your iTunes library from the destination folder they have been saved into or you can also add the folder so it can be automatically synced by iTunes, this can be done also by making your destination folder the same as your Video folder on iTunes. Unfortunately, unlike media centers or even other options like Roku, Apple TV does not allow you to read your movies from an external storage such as an SD card, an USB flashdrive or an external hard drive, and it does not allow you to store your videos or movies into its memory. Apple TV will stream the movies, music and everything as it syncs with your iTunes library. Syncing your videos or movies without changing their location in your computer is very easy, all you have to do is hold the Apple and the Option keys as you drag and release your files into your iTunes library. This will help you make your files available on Apple TV without making another copy of them in your videos folder on your hard drive. You can still watch your videos and movies on your Apple TV even if they are no longer in your computer. Once you have imported the videos and movies into iTunes with the former technique they will always be available, you just need to keep iTunes from syncing once you have deleted the files. Store your videos in an external hard drive and seeing them in your Apple TV importing them into your iTunes library, they will be available to stream in your Apple TV. All you need to make sure is that the external hard drive is connected to your computer as you are streaming movies from it. In the end, as you can see iTunes is the engine that makes possible you can enjoy your media through all your Apple devices. And even though at first it can be a little confusing or even frustrating task, there are several workarounds and tools that in the end will make your life much easier. Image: you can anjoy pictures on Apple TV as long as they are JPEG, GIF and TIFF files. Audio: Apple TV offers great support for AAC audio files from 16 to 320 kbps on bitrate speed. Other options for AAC include DRM-protected audio (FairPlay AAC) and High-Efficiency AAC (HE-AAC). Apple Lossless audio (ALAC) files are accepted as .m4a files. Other formats include MP3 (16 to 320 kbps or variable bitrate speed), WAV and AIFF along with Audible formats for audiobooks and podcasts. Video: on Apple TV you can enjoy movies or any video on HD (720p) and FullHD (1080p) and lower resolutions that use H.264 compression at 30 frames per second (fps) on .m4v, .mp4 and .mov file types. You can also enjoy M-JPEG at 720p and 30 fps. Remember that you can also enjoy HD TV content at 1080p and 720p and 60 or 50 Hz through HDMI televisions, so Apple TV offers a lot of options for you to enjoy nearly any kind of multimedia on this device.